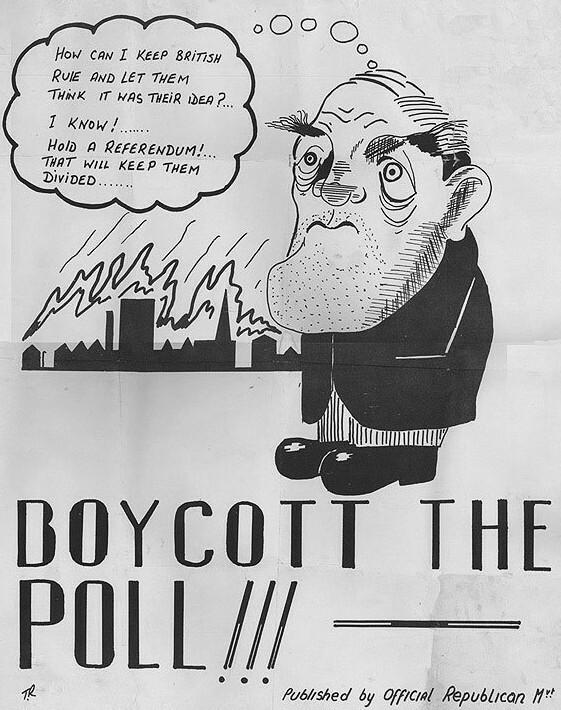 From the 1973 Border Poll (also known as the Northern Ireland Sovereignty Referendum) a poster from the Official Republican Movement urging a Boycott of the poll. The figure in the poster I think is that of the then Northern Ireland Secretary, William Whitelaw. There were two choices and 591,280 people voted to stay part of the UK whilst , due to the boycott, just 6,463 voted in favour of a United Ireland. I’ve a Ballot,Envelope, Polling card etc from the poll posted Here .